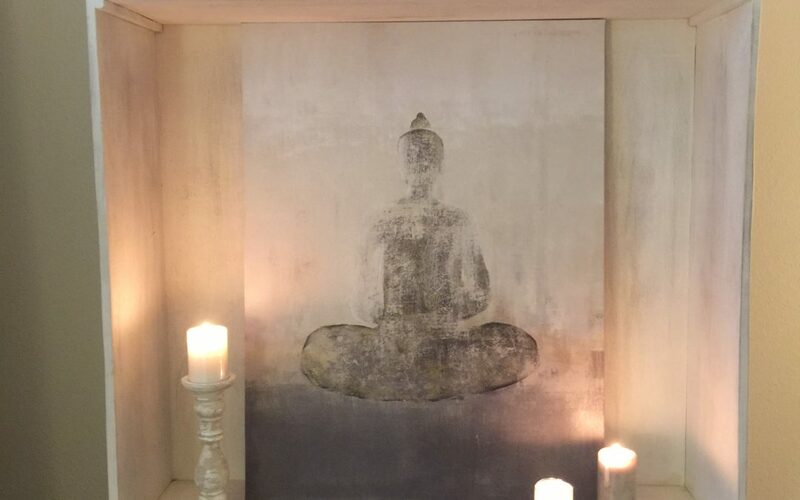 I like my peace and being surrounded by things in my home that remind me to stop, inhale, exhale and settle. I purchased this painting because of what it did for my spirit . . . not for my ego. How do I know the difference? From ego, the purchase would have caused anxiety from buyer’s remorse. And there would have been an anxiousness around the desire. In this case, there was no desire, no anxiousness, no remorse, only calm and so I purchased it. Texture: Select decor that combines textures of smooth and rough like a candle and a stone or a ceramic vase and a chime. Texture can offer subtle contrasts that calm and soothe. Visual focus: Select an image or object that causes you to “pause”, to take a deep breath, to inhale and exhale. It is a visual trigger to settle into serenity. Aromatherapy: My personal favorite are my candles that add a calming aroma to the space, but essential oils can be just as powerful. Flow: It was important for me to create an altar that would blend into the surrounding design but be large enough in it’s proportions to catch my attention each time I walk into the room. Now I am constantly reminded to pause, breathe and bring harmony and balance into my state of being for meditation or yoga practice. Make sure you honor the flow of your altar into the design of your room.